I've been thinking hard about my collection of cars and decided I want to concentrate on the S2 and my MK II Golf 16V, the Golf as a daily driver and the S2 as my high days (track day) and holidays car. I find it gets to the point where I don't know where to start when I have more than one project on the go. I don't want to part with the 90 one bit and know one day I regret it, but it's sat outside slowly rotting and I've got my hands full as it is. Sticking a grinder through my thumb last year has really put me behind both financially and time wise. I'd also like to be able to spend some actually time driving my cars as opposed to working on the all the time. The 90 has no tax or MOT, done about 150K with some history (got the original service book) and all old MOT's. The body is not too bad as they go, no holes in the floor, boot or A posts but it does need both cill's doing and a couple of the doors have rot along the inside bottom. It does run well (well it did last year) but the head-gasket is leaking, the drive train is excellent both diffs lock properly and are quite ect. Both front springs have cracked but I have some freshly sand blasted front struts and springs to go with the car. The car is now sat on 14 inch R8's as per original, tyres are legal but old and budget. Interior is very good, just the normal drivers seat wear and tare, it is however all stripped out and in my attic as I was in the early stages of preparing it for welding as well as checking for hidden rust. It has central locking and electric windows on all four doors and yes it all still works! I'd just like to get my money back on it which is 500 quid, I know I could make a lot more braking it but would rather it lived on, they are after all getting rare. This will make a great project for someone. PM me for my phone number. Last edited by K Simmonds; 11th December 2011, 12:09. Right, I've had a Couple of serious enquiry's from people on here so went to the trouble of cleaning and photographing the car and it's bad points in detail. Unfortunately the rot along the cill's has gotten a fair bit worse over the time that's past since laying her up, enough to put them both off anyway. To top it off I couldn't get the dam thing to go the other day when I tried to start it, no fuel getting too the metering head. I bridged the FP relay and, nothing, so it looks like the pump has seized from being stood for so long. Funnily enough I've just had to change both pumps on my MK 2 16V which had been stood for a similar amount of time. Bummer as the 90 ran really well when I last drove it 18 months ago . Anyway, as a last reprieve I'd let it go for 450 quid if someone can come and get it before bloody Christmas and I'll give it till the day after boxing day before I start to strip it. I now have about 40 very detailed photos of all the bad aspects in detail, as well as the car in general. I can happily email them over to anyone interested. Before peeps start slating me for breaking a rare car please PM your email address and I'll show you my reasons. Just done, am open to an offer for a quick sale. Would you like to see the pics? Last edited by K Simmonds; 2nd January 2012, 19:12. Sent the photos too a few people now, hopefully someone fancies a nice project. The money would be going to a good cause, mapping my S2 . 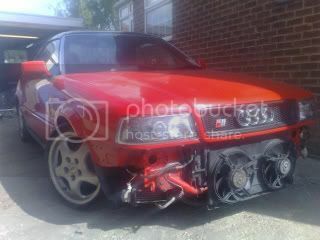 I'd chuck in the 10VT engine I've got and was planning on fitting to this for 600 all in. Want this gone, will start to strip it within the next week. I'll have a chat with you tomorrow. It's looking like she's going to get scrapped though, no serious interest and it does need some serious welding. Was about to list it on ebay but got put off by the fees! !